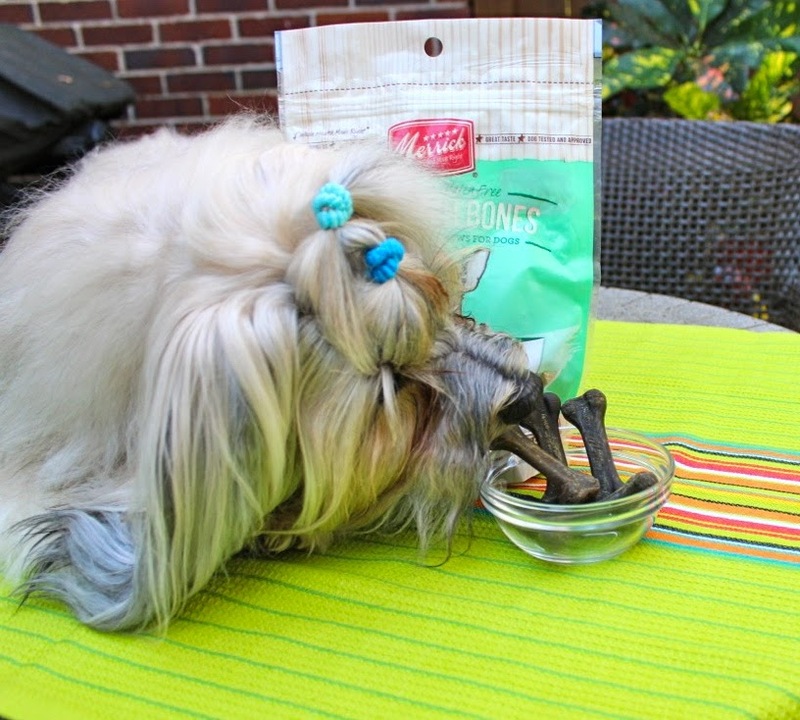 In our household, there are LOTS of occasions to give a dog a treat! So we were really excited to learn about Merrick's new line of grain-free and gluten-free treats that includes FOUR different types of treats in a total of TWENTY different varieties and flavors. That's a lot of variety to keep a pup interested and motivated! Made in the USA, with no ingredients from China. High quality ingredients with real meat, fruit and veggies. 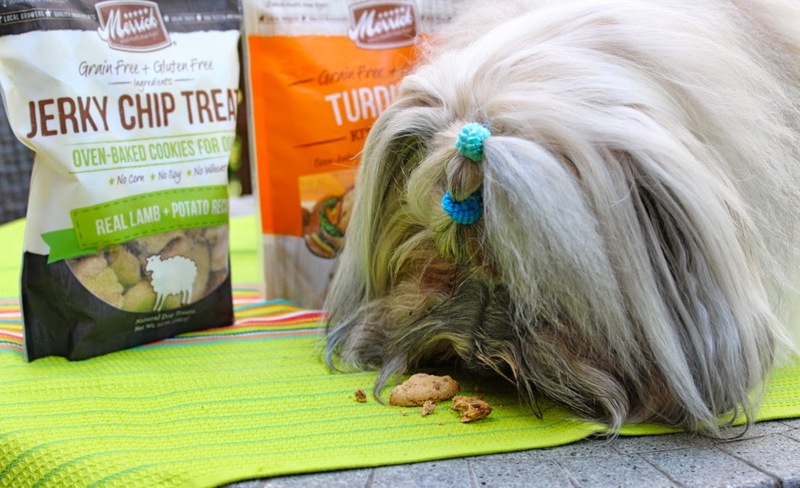 Grain- and gluten-free with no corn, wheat or soy (none of the fillers your dog doesn't need). Nothing artificial or scary looking in the ingredient list. So we look for treats with no artificial colors or preservatives. 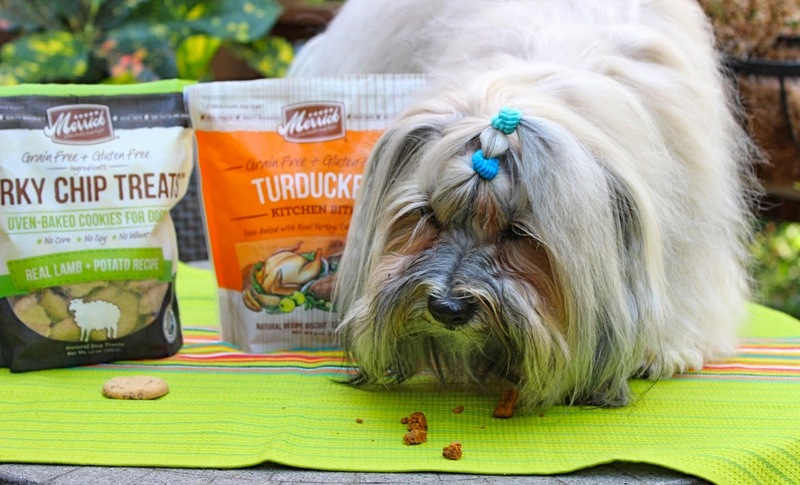 What we love about Merrick's new treats is they're all these things and more. So I couldn't wait to see what Rocco thought of them. The new lineup includes biscuits (Kitchen Bites), soft & chewy training treats (Power Bites), Dental Chews and dog cookies (Jerky Chip Treats) – all grain-free and gluten-free. So how to decide what to treat when? Here's how we do it. First let's talk dog cookies and biscuits. I like these for Rocco as a special treat, a bedtime snack and a reward for coming inside after he goes potty outside. You do want to treat responsibly by choosing healthy treats and accommodating for the calories in your dog's daily diet. I typically break a cookie into about four (or more) smaller pieces since Rocco's a smallish pup. Rocco not so patiently dives into the Kitchen Bites!… and devours the cookie! He moves on quickly to the Jerky Chip Treat with equal gusto! 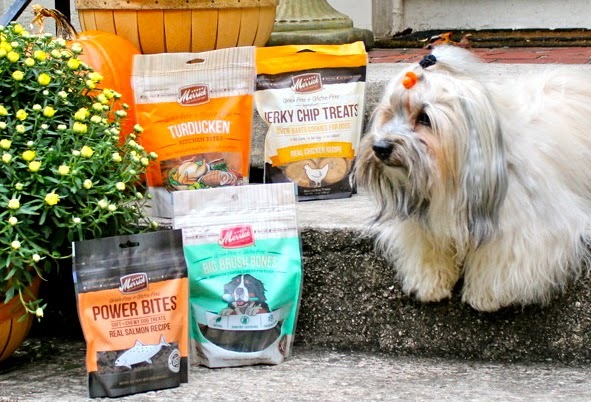 Rocco LOVES both the Kitchen Bites and Jerky Chip Treats and I love that they both are filled with quality proteins and other healthy ingredients. Here's a bit more on both. Merrick Kitchen Bites: These are oven-baked biscuits made with deboned meat as the first ingredient, and inspired by Merrick’s award-winning classic cans in six flavors – Wingaling (Applewood Bacon and Hickory Smoke), Turducken, Brauts N Tots, Cowboy Cookout and Grammy’s Pot Pie. 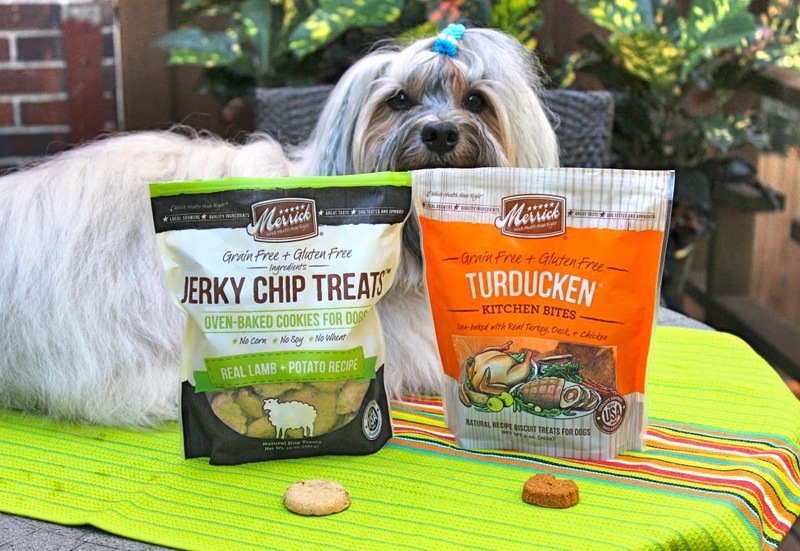 Merrick Jerky Chip Treats: These are the newest addition to Merrick's line of grain-free and gluten-free treats. 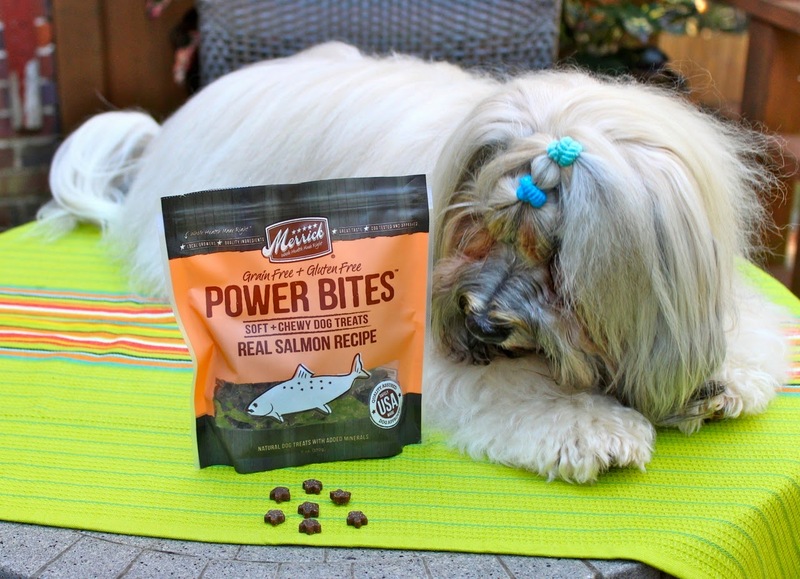 These oven-baked all-natural dog cookie treats are filled with protein-packed jerky chips, in four flavors including chicken, beef, lamb and salmon. Next we tried the Merrick Power Bites. These are soft and chewy treats with deboned meat as the #1 ingredient. They're small enough to use for training where we typically use LOTS of treats. AND, they're soft enough to break even smaller so we can treat even more. We used this training opportunity to proof Rocco's down/stay. The Power Bites provided a HUGE distraction! I'll use Power Bites for our agility and tricks training, and when we're out walking to keep Rocco focused on me when distractions come by. It didn't take much encouragement to get Rocco to inhale these treats too! Power Bites come in Beef, Turducken (turkey with duck), Pork, Salmon, and Chicken. And, these are one of the only soft and chewy treats made without artificial preservatives. Finally, Rocco loves a good chew and I like giving him dental chews to help with his dental health. Rocco's a bit "over" having to stay and wait! He LOVES these too! 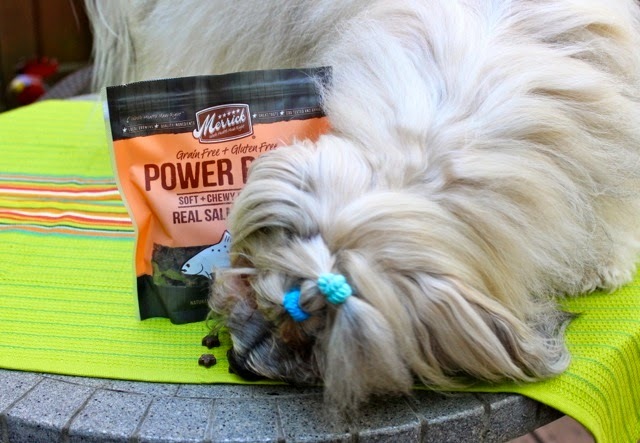 Merrick Dental Chews clean dogs’ teeth and freshen breath with all-natural ingredients. These chews come in five different shapes & textures and, unlike some other dental treats, do not contain grain (like wheat) or gluten. Available in three sizes of brush bones (Mini, Lil and Big) as well as Flossies and Texas Toothpicks. It's time to grab one and run! 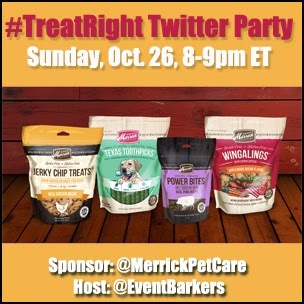 RSVP for #TreatRight Twitter Party for a chance to win from Merrick Pet Care! We hope you'll join us at the #TreatRight Twitter Party this Sunday, Oct. 26, 8-9 p.m. ET. There will be plenty of chances to win yummy prize packs from Merrick and lots of fun too! 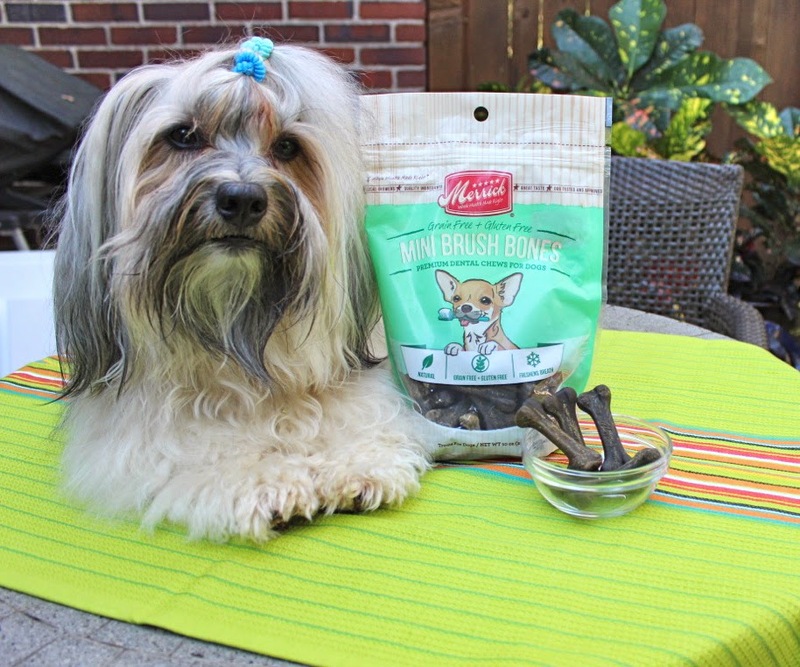 We are working with Merrick through our partnership in Event Barkers to produce this Twitter party and share product news with our readers. Prizes will be provided and shipped by Merrick. To Dog With Love only shares information we believe in. All opinions expressed herein are our own. Enjoy. Peeps like the look of the power bites as they are nice and small so more for me. Have a wonderful Wednesday. We love Merrick and those jerky cookies are my favs!